When the patagonian mountains are calling.. /Wenn die patagonischen Berge rufen..
First of, when I first started planning my trip I intended to hike the O-Trek in the Torres del paine Nationalpark in Chile, the trek taking you about nine days through the backcountry of the park as well as to all the points like the less strenuous W-Trek. I was super keen until I figured out after a lot of researches that it´s necessary to pre-book campgrounds (as well as refugios, but that wasn´t an option anyways) as only a limited number of people is allowed on the track, because by now it has become too famous for it´s own good. With less than a week planning time of course there was no availabilty anymore. Even more frustrating is the booking system- three different organisations “own” the campgrounds so you might be able to book with two of them, but then not being able to get onto the campground of the third company, which might be in the middle of the track, making the whole mission impossible. While I wasn´t able to go in the first place, I as well kind of lost interest in it, because tracks full of people that need to be pre-booked just don´t really tickle my adventure nerve anymore. And now don´t get me wrong, I´m sure it´s an incredible track and I might still go on it next time I head down that way, but all I´m saying is don´t worry, if you don´t make it. There are so many gorgeous less famous tracks that will make you just as happy. And save you a whole lot of money. My sole reason for this trip was to get out hiking and spend as much time in nature as possible, with my backpack packed with the essentials- sleeping bag and mat, little cooker and gas, (too much :D) food and some warm layers as the autumn in Patagonia is a cold one already-I set out and found exactly what I had been looking for and a little bit more. Mountains and glaciers and dark green forests and green meadows and tracks that took me just out of my comfort zone. I slept in the woods close to the track when night crept in and woke up to the snow outside, I got rained on way too many times and had the sun coming back everytime to lift my spirits back up. I got blisters on my feet and sore skin on my hips from carrying the heavy backpack. And I could not have been any happier out there where my soul truly belongs. The very first hike I did on my trip! While it easily can be done as two dayhikes starting and ending in El Chalten (if you fancy a bed in town) you can as well easily spend 2-3 days up there, linking the two tracks (that linking track being way quieter, which is a welcome change to the heavily walked main tracks) and staying on the free (!) campgrounds. The tracks are easily walked, very well marked and a good way back into the hiking life 😉 Only the way up from the campground to the Laguna de los Tres might be a tad bit more challenging for the unexperienced as it goes up steep on loose gravel- on the way back down I was happy to have those hiking poles with me! 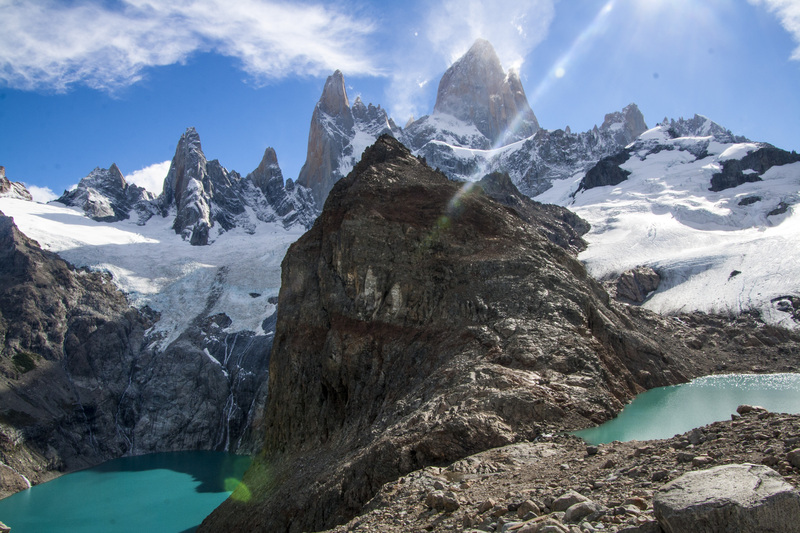 But oh the view of Fitz Roy makes you forget every sore muscle, what a beauty! The sheer rockfaces pointing up towards the sky, the layers of granite telling stories of years long gone past, snow and ice present even in the summer months, a glacier making it´s way too the blue lagoon. I stood there, awestruck, never knewing such beauty existed. Humble in front of this mountain. 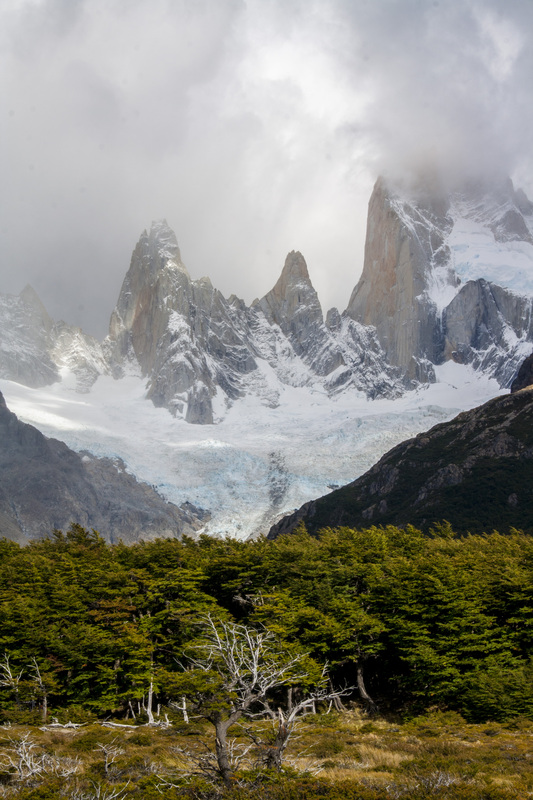 That afternoon the clouds were quickly rumbling in, leaving most of Fitz Roy behind a grey veil, a fierce wind blowing and rain setting in. And still I couldn´t have cared less, I stood there, not being able to take my eyes off him. The next morning I woke up to rain steadily drumming on my little tent, a lake forming around me. I just sat it out, there was nothing else to do anyways. And oh was I rewarded! 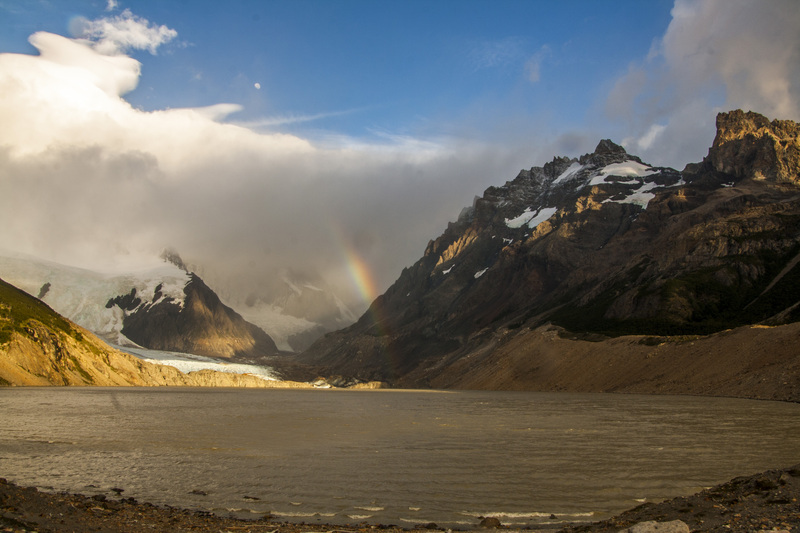 When the rain had eased to a drizzle I changed my original plans of packing together and hiking on towards Cerro Torre and instead hiked to the nearby glacier and later decided to get back up to the Laguna de los Tres as the clouds were clearing. I spent hours up there under a blue sky, two blue lagoons and the mountains in my view, little flirry clouds bouncing off the rockfaces, making it look like a vulcano (this is where El Chalten got it´s name- meaning “The Smoking”, referring to Fitz Roy which can be seen from the little town). 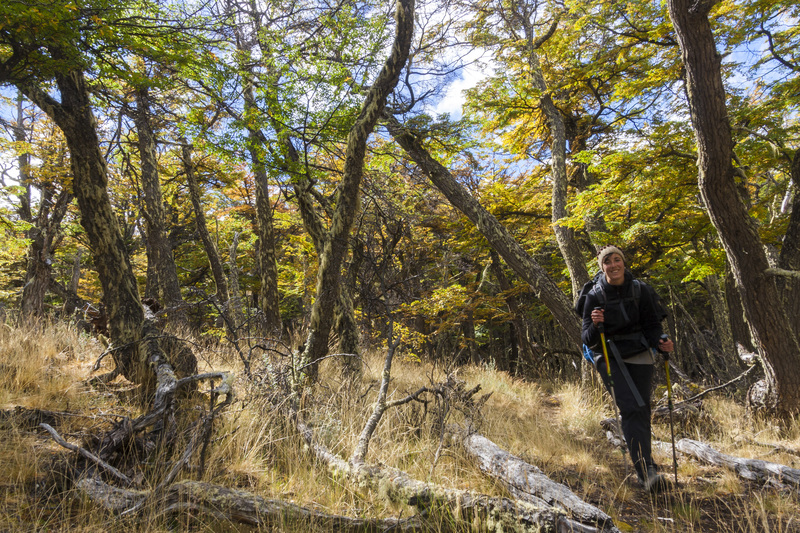 There´s several border crossings between Argentina and Chile that can only be done by foot- no asphalt or roads or whatsoever around, only nature and forest. One of them is the border between El Chalten in Argentina and Villa O´Higgins in Chile, which I set out to do. When pressed on time it´s possible to do the whole crossing from Argentina into Chile (or the other way around) in a day. 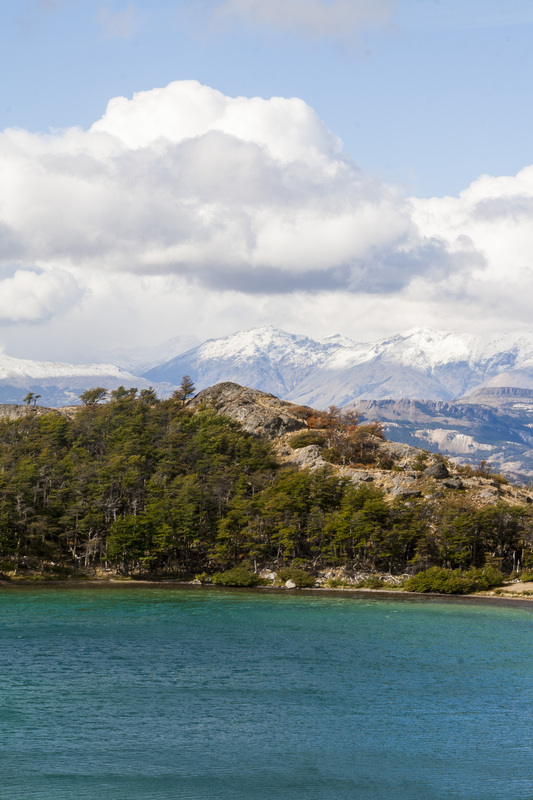 There are shuttle busses from El Chalten to the south end of the lake and boats going from there to the North Shore, where the argentinean border office is located- from there it´s a 23 km walk to the chilean border office and the little harbour where you need to catch a boat to Villa O´Higgins. 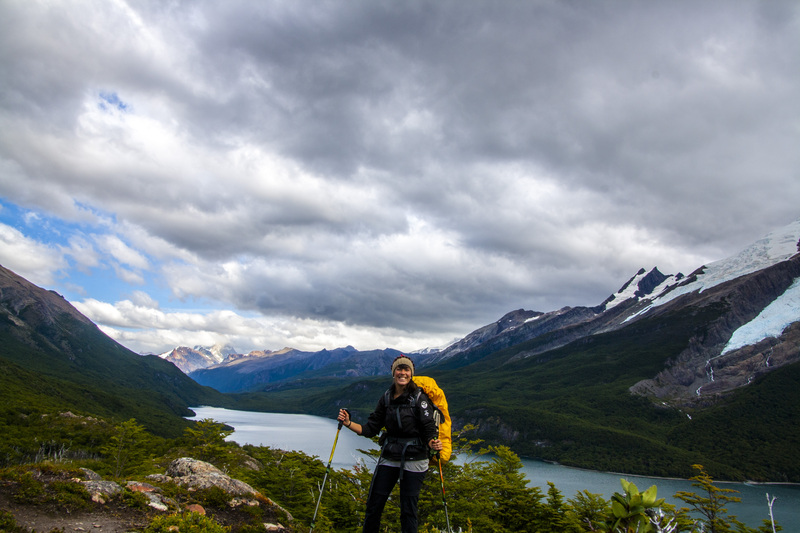 Or, if you´re crazy enough, you can just walk the whole way 😀 While the way from El Chalten to Lago del Desierto has beautiful landscapes it´s just 37km of gravel road and I really wouldn´t judge if you´d just opt for hitchhiking. Especially on those windy and rainy days that are bound to happen 😀 The track around the lake really is beautiful though! It winds itself through the dense woods, up and down more or less steep hills, crossing uncountable little streams of water running towards the lake- yet again I was happy to be equipped with hiking poles that helped me and my heavy backpack balance over fallen tree trunks and skipping rocks while keeping my feet try. Long grass hanging from trees, the forest floor covered with thick moss, the lake always to the left, glistening inbetween the trees. 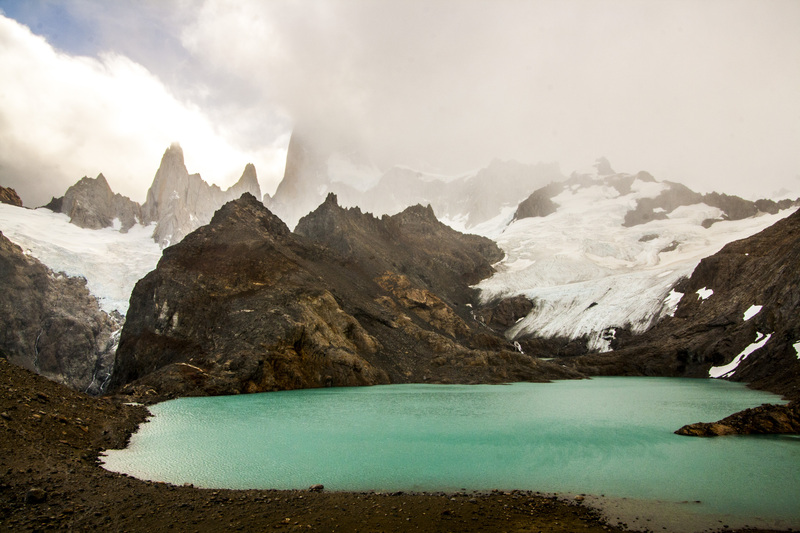 Waterfalls and glaciers on the other side of the lake and a tiny glimpse of Fitz Roy when I emerged from the woods and the clouds lifted for just a moment. Walking the last few meters towards the border office had me believing I´d arrived in some kind of paradise-green meadows, the water quietly rolling onshore, birds and horses, the sun coming out. Before I knew it I was sitting in the warm office, Mate in hand, talking to the few officers- the perks of being a female solo traveler 😀 I left several hours later with a freshly baked loaf of bread in my hand, ready to build up my tent and call it a night. A thing about the boats leaving for Villa O´Higgins- they go several times a week, depending on the season and they suggest you book it ahead, which I didn´t because the office in El Chalten was closed already. Anyways, I highly doubt they ever go the scheduled days, as the water tends to get really rough and they can´t set out, so in the end boats go whenever the weather is good. 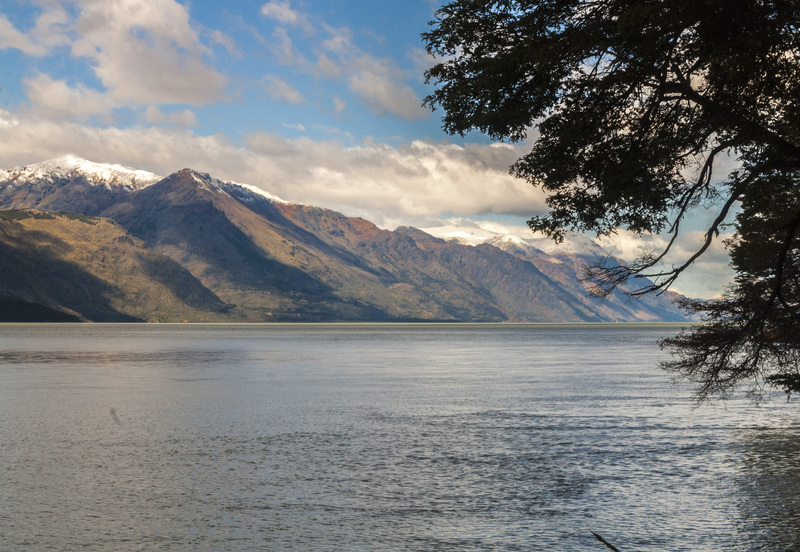 I´ve heard of people being stranded on either side of the lake for up to a week! 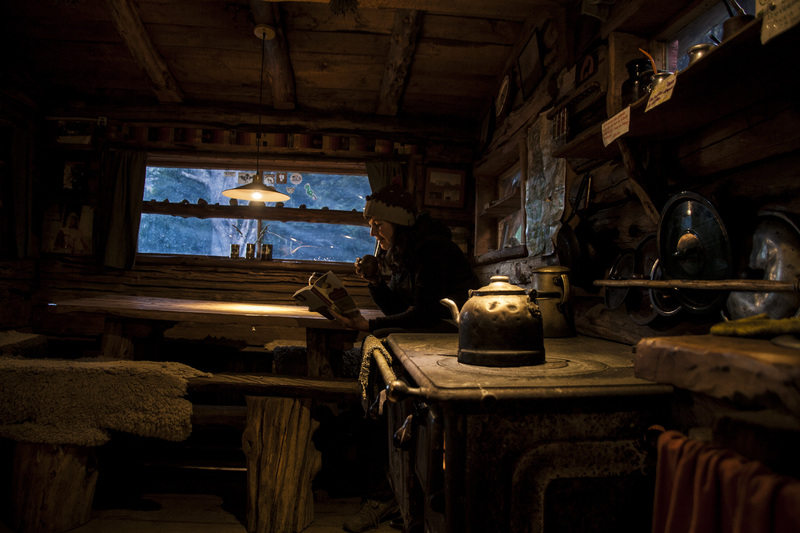 I woke up the next morning to a steady rain, knowing my boat wouldn´t leave until the day after tomorrow I snuggled back into my sleeping bag and dozed off again. The day was spent reading a book I had borrowed from the officers, one of them checking in on me making sure I wouldn´t be too cold and watching the rain fall and fall and fall- until the nicest officer came running telling me that one small boat would be going tomorrow and I should get on it, just in case. So I hastily packed together, got my passport stamped, bid farewell to the nice guys and set out in the drizzle- muddy slippery tracks all the way up to the actual border (which is just a sign on both sides), at times the track was literally just a lake, hiking boots splashing through the water. Once on the chilean side it turns into a 4WD road, not as adventurous, but easier to hike, having to get as close as possible today in order to catch the early morning ferry tomorrow. But eventually night starts setting in around me and I quickly choose a flat spot in the forest to set up my tent. When my alarm went off just before six the next morning it was freezing and it took a lot of pep talk to get me out of the sleeping bag and into the cold where snow started falling when I was packing together. And so I walked the remaining kilometers through the silently falling snow, the world slowly waking up around me and the sun fighting through clouds. 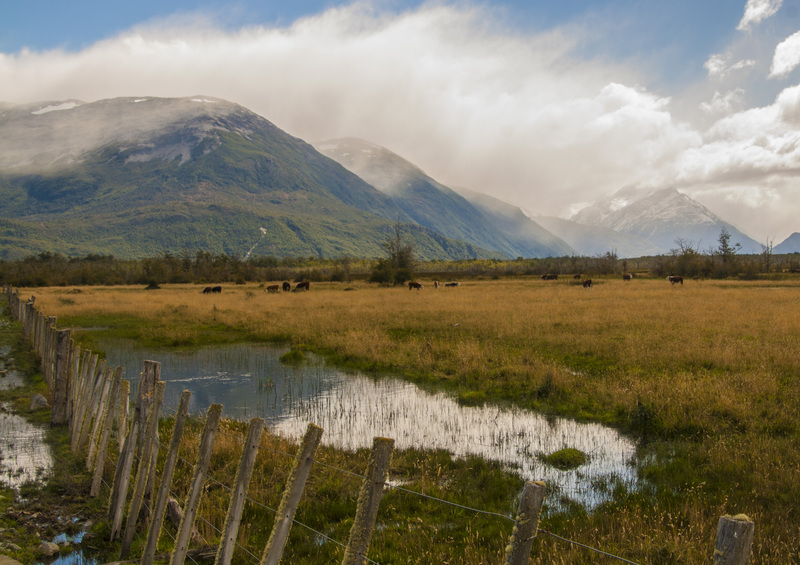 The track is part of the „Parque Patagonia“ in Chile, close to the little town of Cochrane in the Aysen region of Patagonia, a private national park created with the funds of „Conservacion Patagonica“. It has several campgrounds and tracks, the one I tackled described as „a challenging 23 km hike with panoramic views“. While I wouldn´t really put it into the „challenging“ category, I could definitely feel it in my legs the next morning after hiking uphill for several hours (it wasn´t exactly helpful that I had my big backpack weighing me down on top of it- if I was to do it again I would definitely leave it on one of the campgrounds or even in the visitor center), but it definitely was beautiful! There are heaps of guanacos and foxes and they even have pumas strolling around (one of the reasons I decided to use the campground instead of camping in the bushes..) the dry lands, mountains towering in the background, the leaves in the forests already changing their green summer dresses for the yellows, oranges and reds autumn brings. A gorgeous blue lagoon rewarding for the long and steep climb, a oasis of peace and beauty surrounded by brownish dry lands. 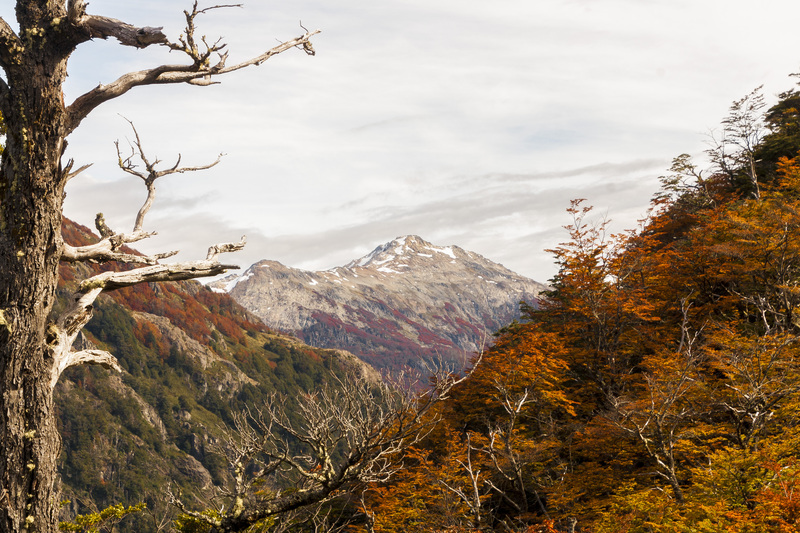 Changing plans is part of traveling and the weather forecast (and already really really cold nights) made me change my three-day-hike in the area of Cerro Castillo to a one day trip. 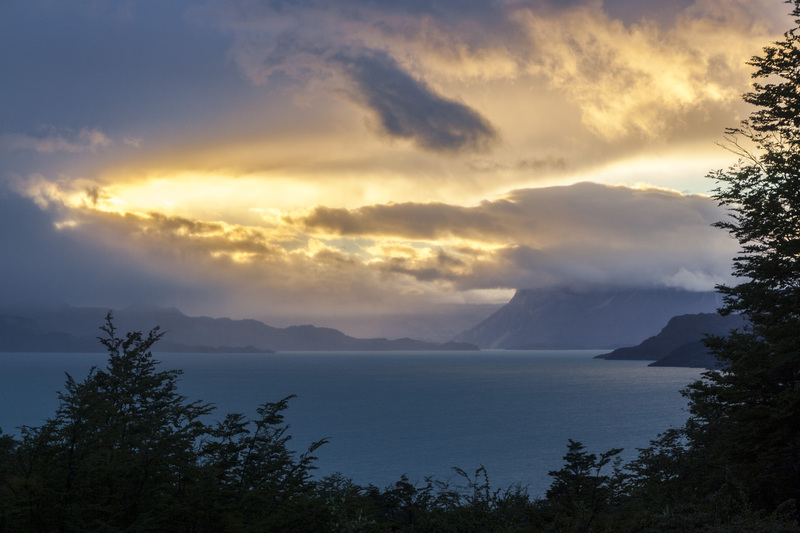 I arrived to the little town of Villa Cerro Castillo in the pouring rain, finding a hostel with campground option and spending the evening cozy warm inside with my israeli friends I had met before on the boat to Villa O´Higgins and the rest of the argentinean-french-german Hostel crew. We all decided to hike up Cerro Castillo the next morning, driving the few kilometers to the trail head in the two vans of two of the couples. And we woke up early to a cloudless sky, stars still twinkling but the dark night slowly making way to a colourful sunrise, not being able to believe how lucky we got- a day with beautiful weather sandwiched inbetween rainy periods! And so we left with happy spirits, excitedly chating, hiking into the gorgeous morning. There is two entries to the trail- one offical one that makes you pay 10.000 CLP (half for CONAF and half for the part of the track that is privatly owned) and another one a bit further down the road (it really is a 4WD, you might get down that hill but getting back up is a different story- believe me, we had to get pulled back up by a friendly local and his pick up truck 😀 ) that is somewhat unofficial but still frequently used and even marked in the maps (check iOverlander for a detailed description and don´t worry about the big red „No entry“ signs- we met the owner of the land at the supermercado later and he just laughed when he recognised us). It was a wonderful hike with incredible views, even when the clouds started rolling in eventually. 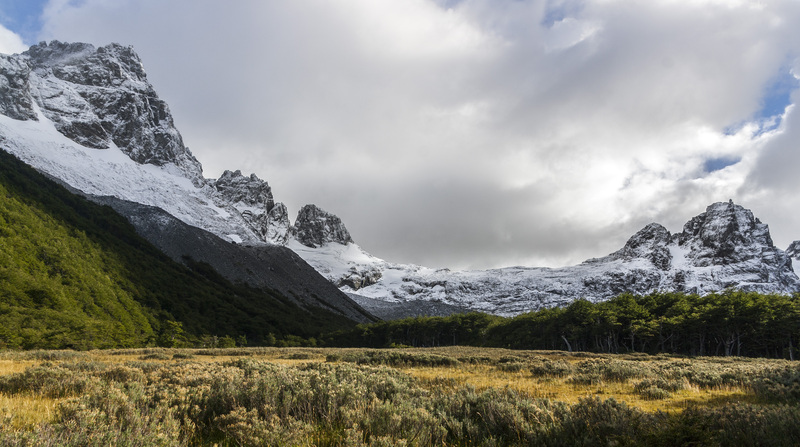 Possibly my favourite hike out of the two months exploring Patagonia! 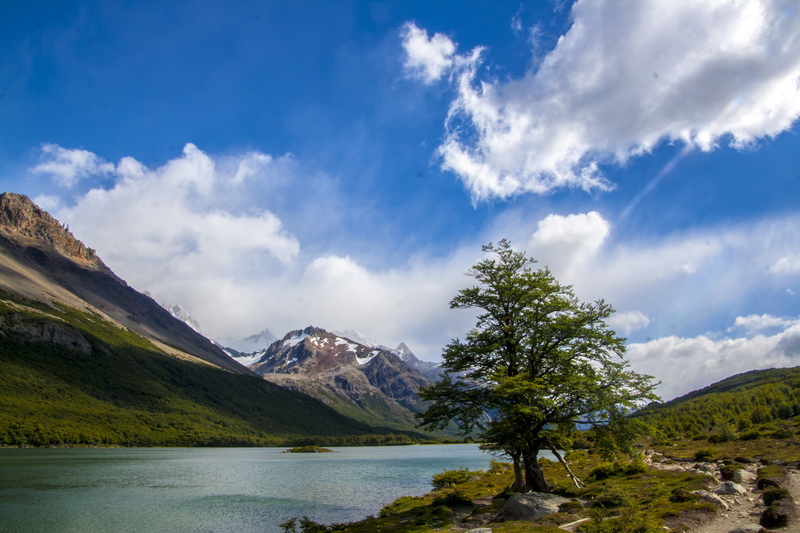 It starts between Lago Puelo and El Bolson in Argentina, easily reached from either of the two towns. 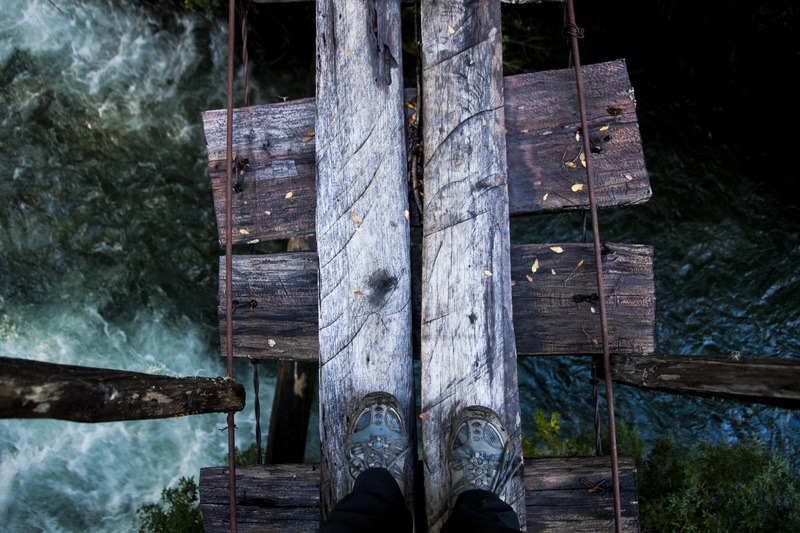 The track goes up and down and up and down through forest and alongside a vicious river over increasingly sketchy bridges. I wake up early the next day, the nice hut warden urging me to go exploring further up the track, reassuring me I´ll have enough time for my return hike anyways. And oh is it beautiful! My breath visible in the cold and crisp air, frost covering wodden bridges, but the clear sky is promising a splendid day! 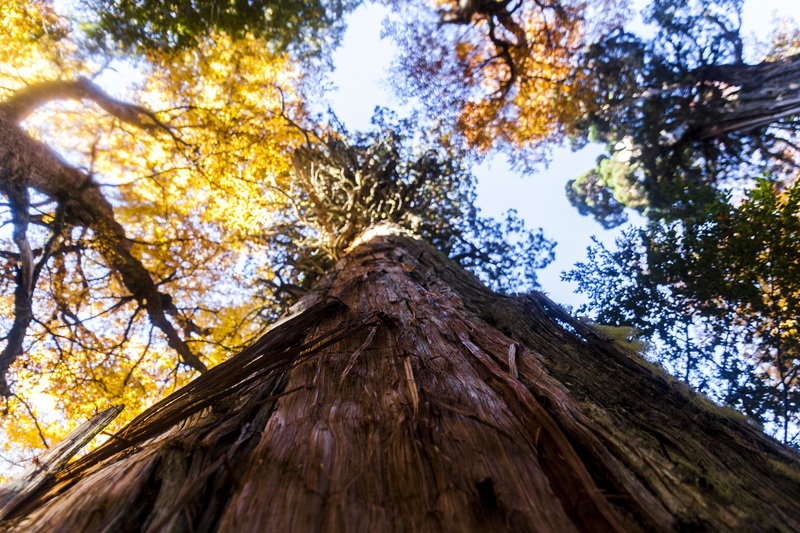 I stumble through the forest and roots, under giant alerce trees, skip over rocks through rivers, even though staying dry just isn´t an option anymore as my hiking boots are slowly dissolving. Cascada Leonardo might just be the most stunning waterfall I´ve ever seen- with it´s two cascades forming a bigger one and crashing down, framed by colourful trees and frozen rocks, the blue sky over it all. 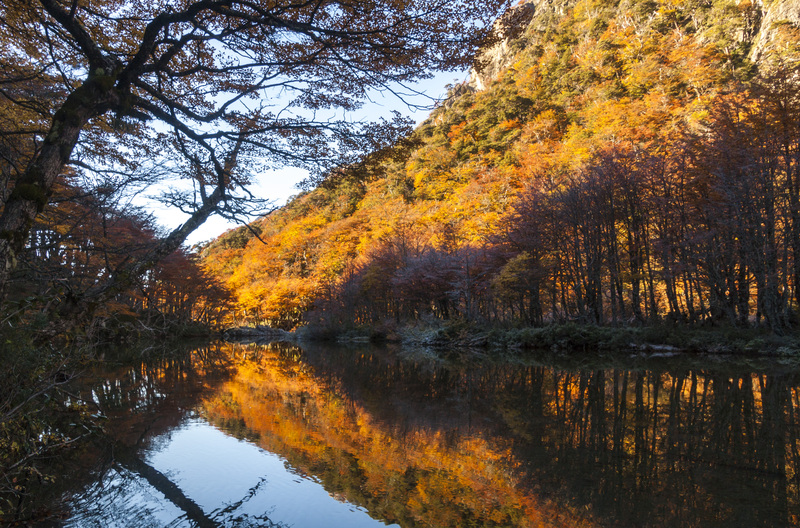 The river further up is almost standing still, the red leaves of the lengas and snowcapped mountains a beautiful mirror image. I stand there, openmouthed, as I take in all the beauty, my only regret is not being able to stay the whole day up here as my food won´t get me through another day. 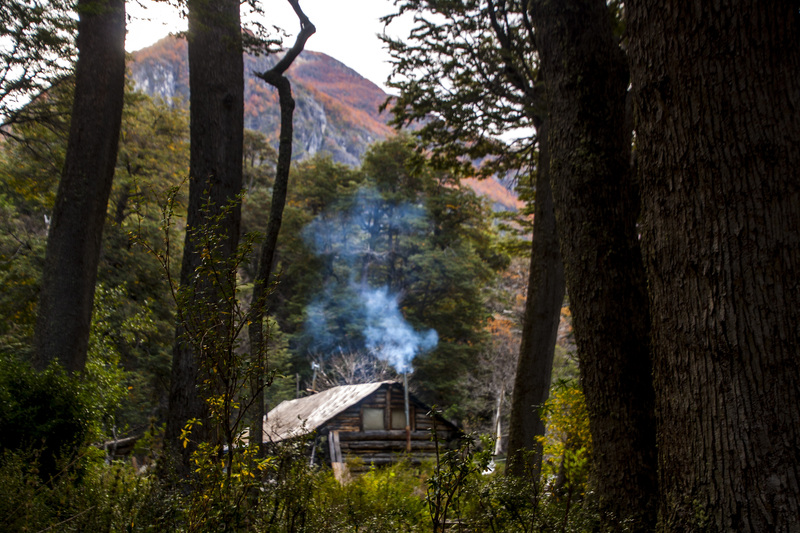 So if you travel Patagonia, make sure you hike the track to the Motoco Refugio! 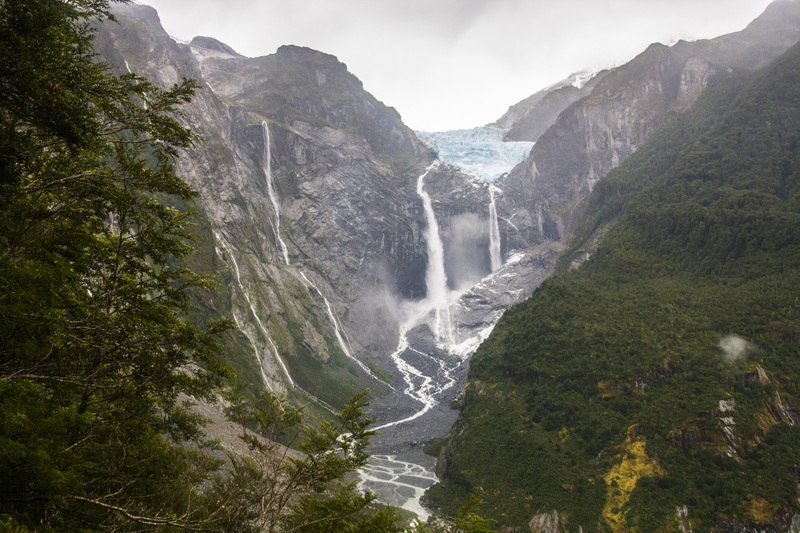 I as well really enjoyed the views of the Veintisquero Colgante hanging glacier in the national park close to Puyuhuapi and the hike itself was good, but nothing too exciting from my point of view. This is a conclusion of my favourite hikes, there were many more I really enjoyed and many more I still want to hike! 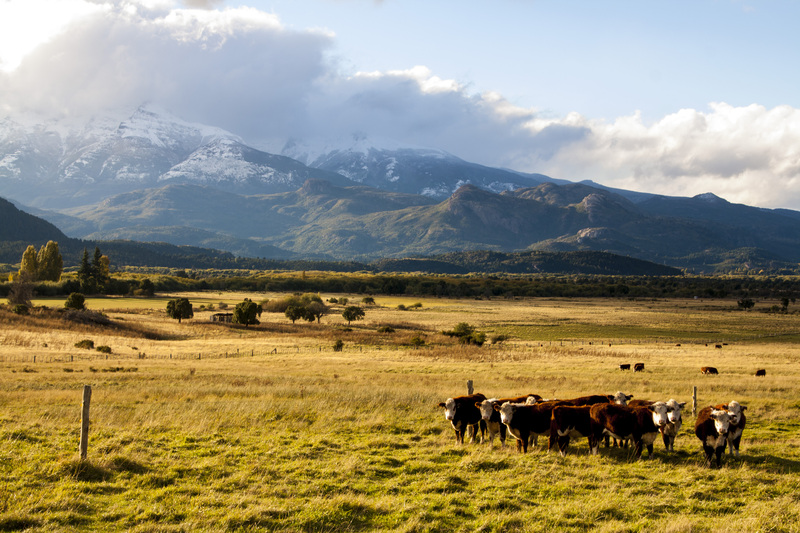 Just get out there and enjoy the wildbeauty Patagonia has to offer! Inform yourself before you go about weather and track conditions and let somebody know where you´re going and when you´re supposed to be back 😉 Enjoy and be safe! Meine erste Wanderung in Patagonien! 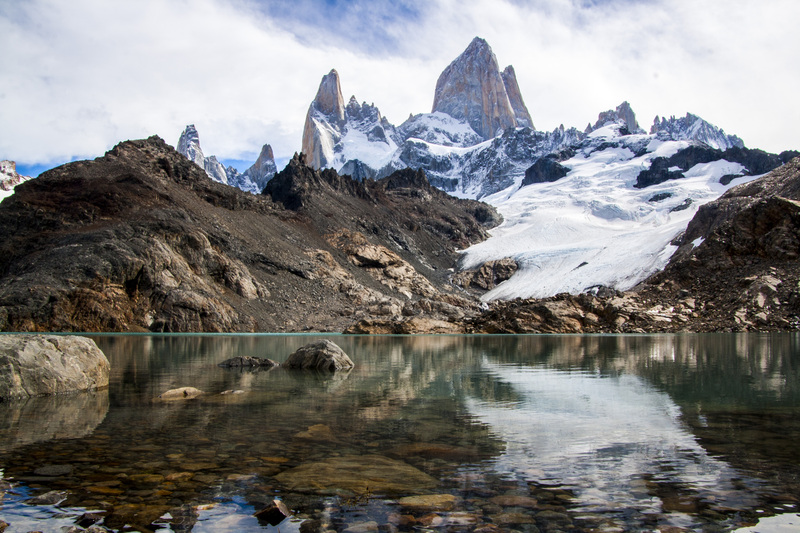 🙂 Während man auch zwei Tageswanderungen zu der Laguna de los tres und Cerro Torre machen könnte (falls einem ein Bett im Dorf wichtig ist), kann man auch locker 2-3 Tage in der Gegend verbringen, die beiden Wanderungen miteinander verbinden (und die Verbindungsstrecke ist wunderschön und viel entspannter!) und auf kostenlosen Zeltplätzen schlafen! 🙂 Die Wege sind einfach zu laufen, sehr gut markiert und eine perfekte Möglichkeit sich zurück ins Wanderleben zu stürzen. Nur die das letzte Stück zur Laguna de los tres hoch könnte für Unerfahrene ein klein wenig komplizierter und anstrengender sein, weil es auf dem steilen Weg viel loses Geröll und kleine Steine gibt- auf dem Rückweg war ich auch heilfroh meine Wanderstöcke dabeizuhaben! Aber der Anblick von Fitz Roy wird dich jede Anstrengung vergessen lassen- was für ein atemberaubendes Stück Natur! Die spitzen Felsen ragen bis hoch in den Himmel, die tausend Jahre alten Granitschichten können Geschichten aus längst vergessen Zeiten erzählen, Schnee und Eis sind selbst in den Sommermonaten vorhanden und ein Gletscher wandert gemächlich zur blauen Lagune. Und so stand ich, ehrfürchtig und staunend. 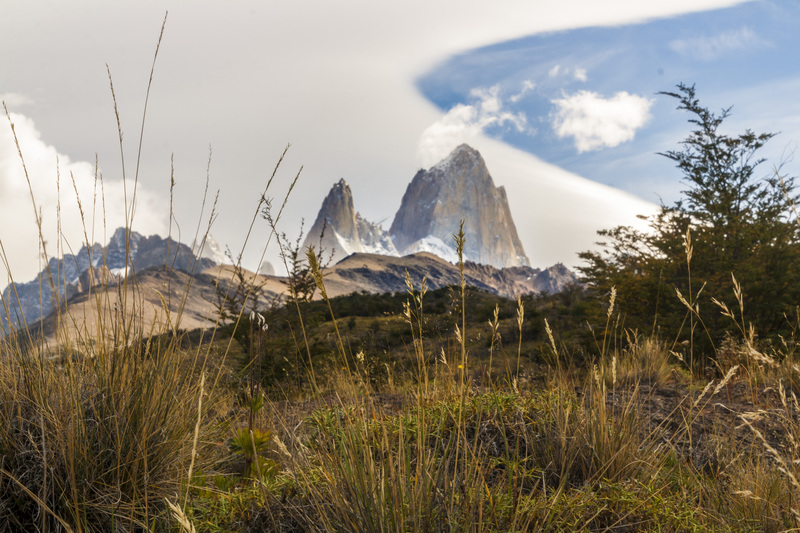 An dem Nachmittag eilten schnell dunkle Wolken vorbei, ließen Fitz Roy hinter einem grauen Schleier stehen, eiskalter Wind setzte ein und Regen begann zu fallen. Doch ich rührte mich nicht von der Stelle, konnte meine Augen einfach nicht von ihm abwenden, spürte kaum den Regen, der mir ins Gesicht peitschte. Am nächsten Morgen wachte ich zu stetigem Regen auf, der auf mein Zelt plätscherte, um welches sich schon ein kleiner See gesammelt hatte. Und so wartete ich einfach darauf, dass es besser wurde- in meinen Schlafsack eingekuschelt und Müsli mampfend. Und ich wurde für meine Geduld belohnt: als gegen Mittag der Regen weniger wurde und schließlich ganz aufhörte spazierte ich erst zu einem nahe gelegenem Gletscher und beschloss dann noch einmal zur Laguna de los tres zu kraxeln und verbrachte den gesamten Nachmittag bei strahlendblauem Sonnenschein, Fitz Roy anhimmelnd. Kleine leichte Wolken versammelten sich um seine Spitze und ließen ihn wie einen Vulkan aussehen (daher bekommt der kleine Ort auch seinen Namen- El Chalten heißt bei den Tehueleche Indianern „rauchender Berg“), die zwei türkisblauen Lagunen glitzerten in der Sonne. 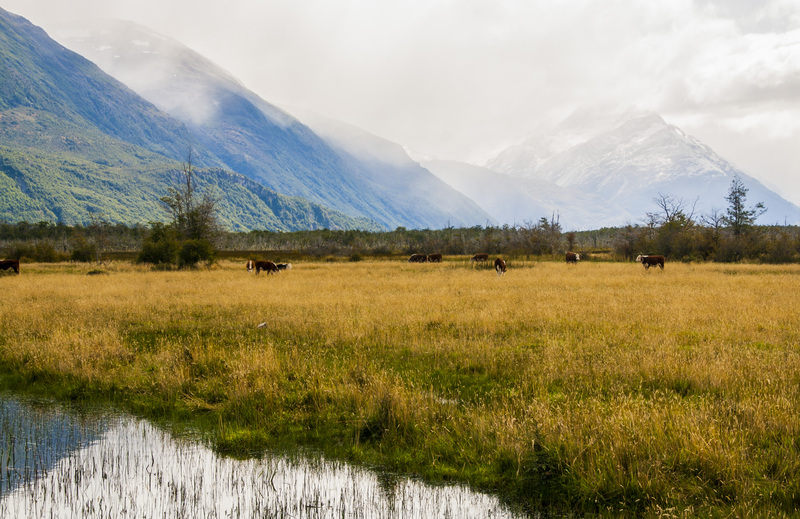 Es gibt einige Grenzübergänge zwischen Argentinien und Chile, die man nur per Fuß (oder auch Fahrrad, natürlich) überqueren kann, weit und breit keine Straße in Sicht, nur Wald und Natur. 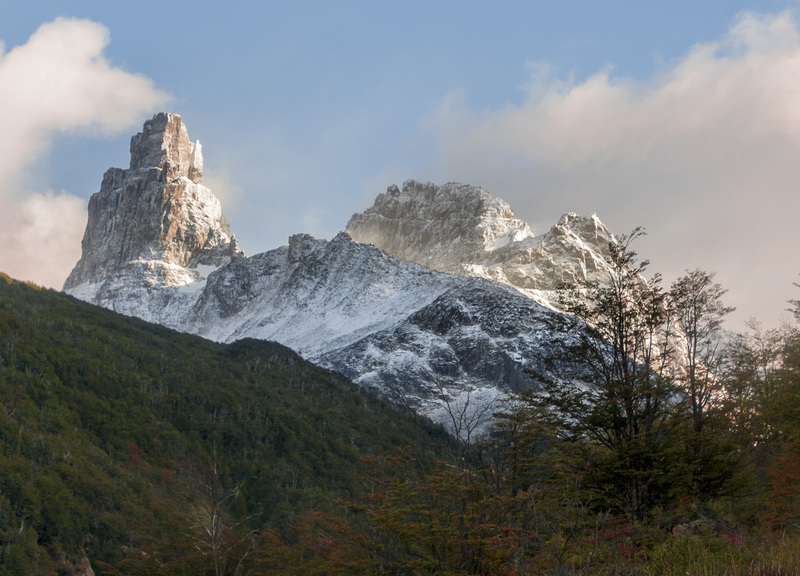 Einer dieser Grenzübergänge ist zwischen El Chalten und Villa O´Higgins, genau den hatte ich mir ausgesucht! 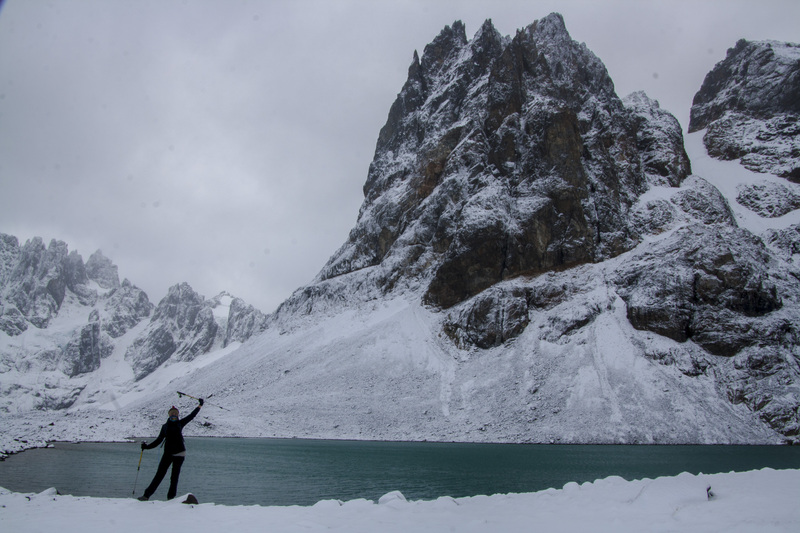 Wenn die Zeit knapp ist kann man die gesamte Grenzübergangswanderung in ungefähr einem Tag absolvieren- von El Chalten zum Lago del Desierto fahren shuttle Busse und von einem zum anderen Ende des Sees kann man mit einem Boot gelangen- lediglich die 23km vom argentinischen Grenzhäuschen bis zum Ufer des Sees O´Higgins muss man selbst bewältigen. Da das aber natürlich nicht meine Idee eines Abenteuerurlaubs ist habe ich eben alles erwandert- schlappe 74km. Die ersten 37km sind landschaftlich wunderschön, aber leider eben nur auf einer Schotterstraße, das wandern macht hier nicht allzu viel Spaß. Deswegen würde ich auch überhaupt nicht darüber urteilen, wenn ihr euch zum trampen entscheidet 😉 Der Track vom südlichen zum nördlichen Ende des Lago del Desierto hingegen ist in jeder Hinsicht wunderbar- ein kleiner Trampelpfad (der ab und an auch leicht zu übersehen ist..), der immerzu bergauf-und bergab führt, immer am Seeufer entlang, unentwegt über kleine Bäche, die man mithilfe umgefallener rutschiger Baumstämme oder weit auseinanderliegender Steine überqueren muss (danke liebe Wanderstöcke!). Langes Gras hängt von den alten Bäumen und Moos bedeckt den Waldboden, auf der anderen Seite des Ufers tosen unzählbare Wasserfälle die Berge herab und Gletscher schimmern blau, wenn die Sonne auf sie fällt- himmlisch. Als ich schließlich die letzten paar Meter zum Gebäude der Grenzbeamten laufe glaube ich in einem kleinen Paradies angekommen zu sein- saftig grüne Wiesen; leise rauschendes Seewasser, welches an das Ufer rollt; grasende Pferde und Vögel und alles umringt von Wald. Eh ich mich verseh sitze ich mit Mate im warmen Häuschen und quatsche mit den Offizieren bis ich ein paar Stunden später zurück in die Kälte stolpere um mein Zelt aufzubauen (und noch einen Batzen frischgebackenes Brot geschenkt bekomme 😀 ). Hier ein Hinweis zum Bootsverkehr nach Villa O´Higgins: Die Boote fahren in der Hochsaison mehrer Male pro Woche, später nur noch ein paar Mal im Monat- ich hatte schon die Zeiten vorher gecheckt und meine Wanderung dementsprechend geplant. Mit der Zeit lernte ich aber, dass die Boote im Prinzip immer dann gehen, wenn es wettertechnisch passt, denn oft ist es so windig, dass sie einfach nicht ablegen können. So wachte ich am nächsten Morgen zu dem plätscherden Regen auf meinem Zeltdach auf, aber drehte mich gemütlich nochmal um, hatte ich doch noch bis übermorgen, um zu meinem Boot zu kommen! Ich verbrachte einen Großteil des Tages eingemummelt in meinem Schlafsack mit einem Buch, welches mir mein Grenzbeamterkumpel geliehen hat (der auch immer mal gucken kommt ob ich nicht zu sehr friere 😀 )- und schließlich kam er auch vorbei, ganz aufgeregt, und erzählte, dass am nächsten Tag schon ein Boot gehen würde und ich das nehmen solle, nur für den Fall der Fälle. Und so packte ich meine sieben Sachen wieder zusammen und stiefelte los in den Nieselregen- der Weg führte bergauf und glich teilweise eher einem Bach als einem Wanderweg, so voller tiefen Pfützen und Matsch war er! Auf der chilenischen Seite (nur ein Schild zeigt den Landeswechsel an) wurde dieser allerdings zu einer weniger abenteuerlicheren aber einfacher zu laufenden 4×4 Straße, die ich entlang wanderte bis die Dunkelheit einbrach und ich mir einen Platz im Wald suchte um mein Zelt aufzuschlagen. Am nächsten Morgen weckte mich mein Alarm um sechs und es brauchte eine ganze Menge Überwindung aus dem warmen Schlafsack in die kalte Nachtluft zu krabbeln um das Zelt bei leichtem Flockentreiben einzupacken. Und so wanderte ich die letzten paar Kilometer durch den leise fallenden Schnee während die Welt um mich herum langsam, ganz langsam erwachte und die Sonne versuchte sich durch die Wolken zu kämpfen. Als ich um acht bei den chilenischen Grenzbeamten eintraff wurde ich mit einem besorgten „Bist du die Deutsche, die alleine wandert?“ begrüßt und als ich bejahte waren die Chilenen sichtlich erleichtert „Ach zum Glück! Die Argentinier haben uns gestern noch angerufen und gesagt, dass wir auf dich warten sollen, weil du spät losgelaufen bist. Und als du dann nicht aufgetaucht bist haben wir uns schon Sorgen gemacht!“ Ach herrlich, wie sich alle um mich kümmern! 🙂 Sie platzierten mich in ihrem warmen Büro, in dessen Kamin ein Feuer loderte und versorgten mich mit Kaffee, frischer Butterbemme und vergewisserten mir, dass mein Boot in einer Stunde ablegen würde. Und so wartete ich nur zehn Minuten am kleinen „Hafen“, zusammen mit anderen Wanderern, die teilweise schon seit einer Woche festsaßen und auf das Boot warteten (und später erfuhr ich, dass mein geplantes Boot dann auch erst eine Woche später fuhr, was für ein Glück! 🙂 ). Die Bootsfahrt war toll, wir schwippten und schwappten über den schon aufgewühlten See, tauschten Wandergeschichten aus, schließen erste Freundschaften mit Reisenden, die ich in den nächsten Wochen immer wieder treffen würde und erreichten schließlich Villa O´Higgings, welche Berge mich so sehr an mein geliebtes Queenstown erinnerten, dass ich mich sofort wie nach Hause kommen fühlte. Es gibt einen kleinen Bus, den man vom Hafen zum Städtchen (Dorf.. es ist eigentlich ein Dorf) nehmen kann und es ist auch ziemlich einfach zu trampen- ich jedoch entschloss mich die sieben Kilometer zu laufen, die Landschaft einfach vielzu schön um sie nur vom inneren eines Fahrzeugs aus zu sehen! 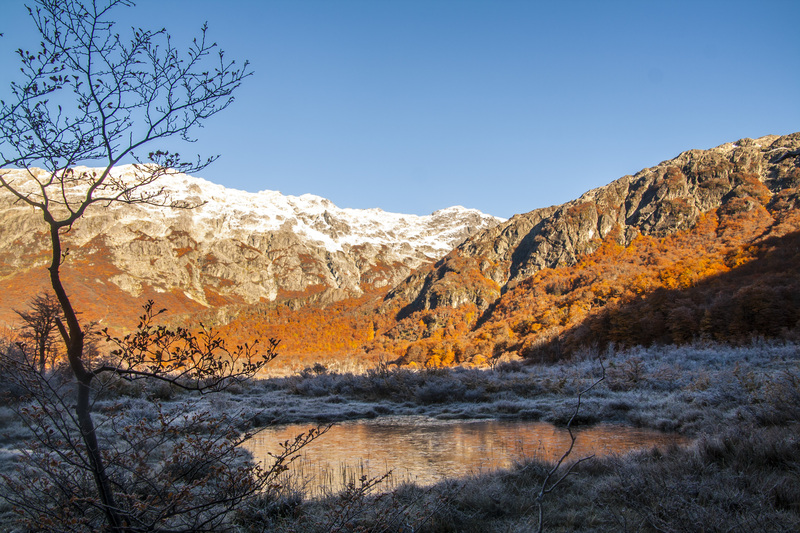 Die Wanderung ist Teil des privat gegründeten Nationalparks „Parque Patagonia“ in der Nähe von der Kleinstadt Cochrane in der Aysen Region von Chile. Es gibt schon jetzt einige verschiedene Zeltplätze und Wanderwege, der den ich mir ausgeguckt hatte wurde in der Broschüre als „herausforderne 23km lange Wanderung mit panoramischen Ausblicken“ beschrieben- während ich sie jetzt nicht wirklich in die „herausfordernd“ Kategorie packen würde habe ich die Kilometer und vorallem die Höhenmeter am nächsten Tag doch in meinen Beinen gemerkt (es war auch nicht wirklich hilfreich, dass ich wieder meinen großen Rucksack spazieren trug, weil ich ursprünglich vorgehabt hatte irgendwo im nicht wirklich vorhandenen Wald zu nächtigen), aber es lohnt sich allemal! 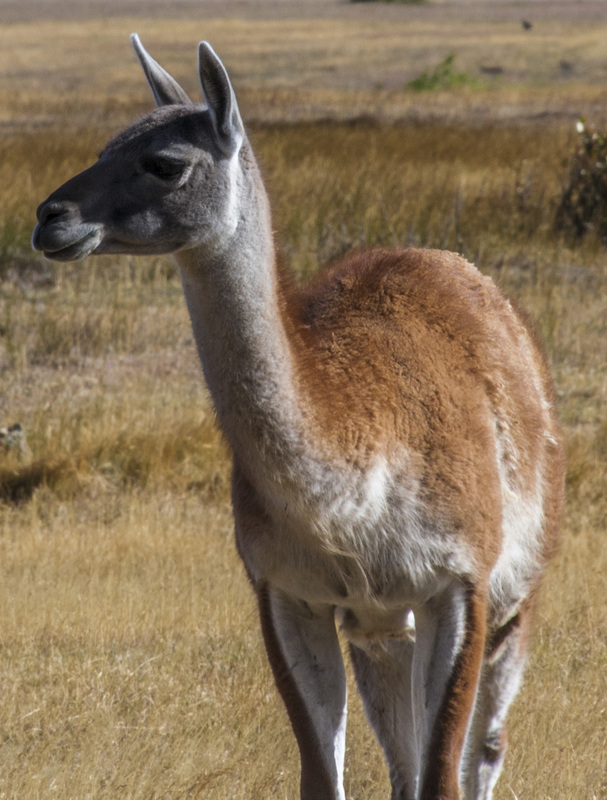 Es gibt viele guanaco Herden (kurzfellige Lamas), Füchse und sogar Pumas durchstreifen die steppenähnliche Landschaft (definitiv auch ein Grund warum ich mich dann für den etwas belebteren Zeltplatz entschieden habe), schneebedeckte Berge in der Ferne und einige kleine Waldabschnitte in denen die Mischwälder schon begonnen hatten ihre grünen Sommerkleider schon mit den Farben des Herbstes schmückten. Und als Belohnung für den steilen Weg bergauf eine wunderschöne blaue Lagune, eine Oase der Ruhe und Friedens inmitten der doch eher kargen Natur. Reisen bedeutet vorallem auch mal Pläne zu ändern und auf Grund einer nicht sehr einladenden Wettervorhersage (und Nächte, die schon jetzt schweinekalt waren) änderte ich meine geplante 3-Tageswanderung zu einer einfachen Tageswanderung am Cerro Castillo. Ich erreichte den kleinen Ort Villa Cerro Castillo im strömenden Regen, fand glücklicherweise ein Hostel mit Zeltplatzoption und verbrachte den Rest des verregneten Nachmittags und Abends in der gemütlich warmen Küche mit meinen Israelifreunden, die ich schon auf dem Boot kennengelernt hatte und dem Rest der braslianisch-französisch-deutschen Hostelbande. Wir beschlossen alle zusammen am nächsten Tag zum Cerro Castillo zu wandern, die paar Kilometer zum Start in den zwei Vans zurückzulegen. Wir erwachten zeitig am nächsten Morgen zu einem wolkenlosen Himmel, an dem noch ein paar letzte Sterne funkelten, aber der dunkle Nachthimmel langsam Platz machte für einen farbenfrohen Sonnenaufgang- und wir konnten unser Glück kaum glauben! Ein wunderschöner Tag inmitten der Regenwoche. Und so wanderten wir frohen Sinnes in den Morgen, ausgelachen lachend und voller Tatendrang. Es gibt zwei Eingänge für die Tageswanderung- einen offiziellen, der 1000 CLP Eintritt kostet und einen anderen, der ein Stückchen die Straße weiter unten ist (die Schotterstraße ist wirklich nur für 4WD Autos- eventuell kommt man den kleinen Hügel noch runter, aber hoch ist eine ganz andere Geschichte 😀 Wir wurden nach viel probieren, fluchen und lachen letzendlich von einem lieben Einheimischen und seinem Pick up Truck hochgeschleppt) und eher inoffiziell, aber trotzdem regelmäßig genutzt wird und sogar auf diversen Karten eingezeichnet ist (bei iOverlander gibt es eine genaue Beschreibung, lasst euch nicht von dem großen „Betreten verboten“-Schild hinter dem Zaun abschrecken- wir haben den Besitzer des Landes später im Tante Emma Laden getroffen und er hat nur gutmütig gelacht als er uns erkannt hat). Es war eine echt schöne Wanderung mit herrlichen Ausblicken, selbst als irgendwann die ersten Wolken angerollt kamen. Als wir schließlich den schützenden Wald und bemoosten Waldboden verließen und begannen über vereiste und rutschige Gesteinsbrocken zu klettern war ich heilfroh, dass ich diese Wanderung nicht alleine begonnen hatte- um ehrlich zu sein, wäre ich als Solo-Wandertane unterwegs gewesen wie sonst immer, wäre ich an dieser Stelle umgekehrt. Zu schnell kann mir hier ins rutschen kommen, stürzen und sich ernsthaft verletzen und dann stundenlang auf Hilfe warten müssen, falls überhaupt jemand vorbeikommt. Aber in der Gruppe waren wir stark und stapften die letzten paar Meter durch den Schnee, ein eisiger Wind blies oben an der Lagune, aber wir alle jubelten glücklich es geschafft zu haben! Eventuell meine liebste Wanderung von meinem zwei monatelangen Trip! Sie beginnt zwischen Lago Puelo und El Bolson und kann einfach von beiden Städtchen aus erreicht werden. Und während die Wanderung im Sommer sehr beliebt und dementsprechend äußerst gut besucht ist hatte ich den Weg jetzt ganz für mich alleine- nur eine Hündin ist an meiner Seite, seit wir uns im Städtchen getroffen hatten. Wir wanderten glücklich singend, der Rucksack leicht auf meinen Schultern, weil ich mein Zelt und ein paar andere Utensilien bei Freunden in Lago Puelo gelassen hatte und mir eine Nacht im refugio gönnen wollte. Die Sonne strahlte von einem wolkenlosen Himmel, schneebedeckte Berggipfel lunsten durch die dichten Blätter und der Weg war gesäumt von Hagebutten. Irgendwann kam dann auch mein refugio in Sicht- eine schöne hölzerne Hütte im Wald, Rauch stieg schon aus dem Schornstein und versprach einen wohligwarmen Platz für den Abend! 🙂 Ein Schaukelstuhl mit Schaffell, ein Bücherregal und ein frisch gekochtes Abendessen- was braucht es denn bitte mehr zum glücklich sein?! Ich erwachte zeitig am nächsten Morgen und die freundliche Hüttentante drängte mich dazu die Wanderwege, die hinter dem refugio weiterführten auch zu erkunden und versicherte mir, dass ich den Rückweg zeitlich trotzdem schaffen würde. Und verdammt nochmal, es war so wunderschön! Mein Atem war sichtbar in der kalten Morgenluft und Eis bedeckte die hölzernen Brücken, aber die knackig-frische Luft versprach einen wundervollen Tag! Ich stolperte durch den Wald und über dicke Wurzeln, wanderte unter riesengroßen Alercebäumen lang, hüpfte über Steine um durch kleine Flüsse zu kommen und holte mir nasse Füsse, weil meine Wanderschuhe sich langsam aber sicher auflösten. 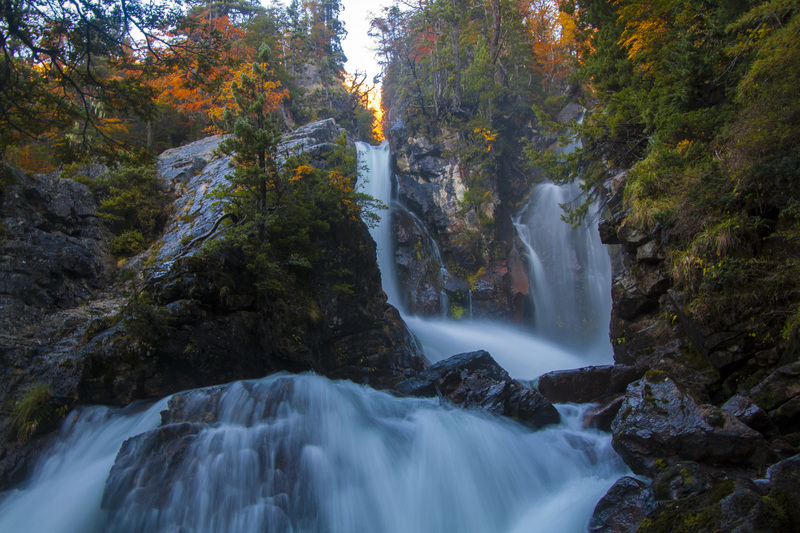 Der Wasserfall Cascada Leonardo war wahrscheinlich der schönste Wasserfall den ich bis dato gesehen hatte- die zwei kleinen Wasserfälle, die zusammen flossen und die Felsen runterplätscherten, umgeben von bunt gefärbten Bäumen, frostigen Steinen und dem blauen Himmel, der über all dem stand. Der Fluss weiter oben stand fast still, so langsam bewegte er sich, die roten Blätter der Buche und die schneebedeckten Gipfel spiegelten sich im stillen Wasser. Und so stand ich nur da mit offenem Mund und staunte über all die Schönheit. Mein einziges Bedauern ist, dass ich nicht den ganzen Tag dort bleiben konnte um weiter zu erkunden, aber ich hatte weder genug Geld dabei um eine weitere Nacht im Refugio zu bezahlen noch genug Proviant. Ich fand auch den Ausblick auf den Veintisquero Colgante Gletscher im Nationalpark bei Puyuhuapi wunderschön, die Wanderung selbst aber nicht weiter nennenswert wie ich fand. Und so sind meine liebsten Wanderungen in einem Blogpost zusammengefasst, es gibt noch so viele andere, die ich schön fand und noch viele viele mehr, die ich unbedingt noch erwandern möchte! Geht einfach raus da und genießt die wilde Schönheit, die Patagonien anbietet! Informiert euch vorher über Wetter-und Wegbedingungen und erzählt jemandem wohin ihr geht und wann ihr zurück sein solltet. Genießt es und passt auf euch auf! Cheers! 🙂 Thanks for reading!